I’ve been really wanting to grind my own grain for a while but I know I should get a grain mill for that. But, they are expensive! I know I just can’t afford one right now. But in The Long Winter, Ma made due grinding grain in her coffee mill. I’m guessing that it probably wasn’t the finest grind but it worked and I’m sure the bread they made with it tasted fine. She made it work and she made due with what she had. I really like using turbinado sugar because it’s not processed. However, sometimes it can be a little grainy for what I want to use it for. So I just stick it either in my blender or in my Magic Bullet and it grinds it down to a fine powdered sugar. No special grinder required, I just use what I already have! I’ve also been wanting to use more gluten free grains just to mix our diet up a little bit. A few weeks ago I paid $4 for 3 pounds of rice flour, I normally pay a little under $1 per pound for rice. So if I can grind my own rice I will end up paying less for rice flour because I can just buy rice in bulk. I found this post the other day by my blogger friend Penny and how she uses her blender to grind rice. I was so excited to see that it works! So what about you? Have you had success grinding with something else? But, I’m hanging onto it anyway, I guess! And what’s a Magic Bullet? A Magic Bullet is like a mini blender. If you do a google search I’m sure it would come up. It just works very quickly and on small amounts of whatever you are wanting to grind. We bought a hand grinder and 150 lbs of wheat while on vacation in Montana last month. Haven’t used it yet because I’m having an issue with my shoulder. 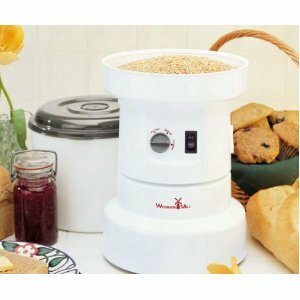 But I’m eager to see how it works and can’t wait to make bread from fresh milled wheat flour! My husband bought me a grain mill for my last birthday. It cost about $60 new and it seems heavy-duty. I already love grinding my own grain so much that I’m going to ask for an electric grinder for Christmas so I can grind larger amounts quicker. I can buy 50lb sacks of grain for $15 or so, which means I can save a ton of money and, better yet, have fresh grain for my family. I use my magic bullet for flour all the time – thanks for the link… I’ll be seeing about a sifter now. I made my first batch of homemade bread using flour I milled myself today!!! Ground with a COFFEE GINDER!!!! It tasted wonderful! My husband even commented that it was lighter and softer than he thought it would be. I too have been wanting to experience the benefits of freshly ground wheat, but it’s just not in the budget to buy a mill right now. I’ve researched all other methods, even came across a homemade mill which essentially was three pipes taped together to “beat” the wheat berries with. I figure if pipes can beat them, a coffee grinder has got to do at least a little better. Recipe I used was: 3 1/2 cups fresh ground hard red wheat, 1 1/4 cup warm water, 1 tbsp. rapid yeast, 1 tsp sugar. I used a bread machine to mix the dough. Add water, yeast and sugar to bread machine, turn on “rest” setting. Stir and let it become bubbly while grinding the wheat. Start grinding wheat. It really didn’t take but about 5 minutes, but with children helping, it took a little longer. Add wheat flour to the yeast mixture. Set bread machine on “dough” setting. * This is a recipe I have used for a while, but not with fresh ground flour. I kept checking on the dough, just interested in how it was coming together really….I noticed that it looked rather dry, so I added about 1/2 to 3/4 cup of water while it was being kneaded. Once dough was ready, I pulled off large “golf ball’ size pieces of dough, folded into several times, put on a bread pan with the seam side down (for looks really, I’m sure it doesn’t matter). of a large baking pan and put in the microwave oven with the light on to rise again. (any warm place will do) Once ready, I baked on 350 for about 15 minutes. This recipe made 14 rolls. So YUMMY!!!! ” Ma made due” that should read “Ma made do” Due is some thing owing. Sorry my brain is always proofreading……. But love your blog!!! !